Jurors convicted 10 pro-Palestinian protesters from the University of California Irvine Friday on charges stemming from an orchestrated series of interruptions during a February 2010 speech by Israeli Ambassador Michael Oren. Superior Court Judge Peter Wilson sentenced the 10 to probation. They faced up to six months in jail for the misdemeanor counts of conspiracy and disrupting a public meeting. The verdict comes after two and a half days of deliberations, wrapping up a trial which pitted the students' right to protest against the freedom of speech by the Israeli official. There is no right for a "heckler's veto" - taking over another person's speech and shutting it down, argued Orange County Deputy District Attorney Dan Wagner. The students cared more about getting their message across than the rules of the meeting, and they planned to disrupt regardless of consequences from the university administration or police. Eleven students were arrested at the speech, but only 10 stood trial. At the center of the trial was the students' disruption method, the so-called "Chicago-style" protest organized by members of the Muslim Student Union (MSU), a chapter of the national Muslim Students Association. Seven UC Irvine students and three others from UC Riverside stood up and shouted accusations of murder and genocide at the ambassador, before being escorted out by police. A large group of cheering supporters staged a walkout shortly after the students' disruption. Wagner told jurors that, more than half an hour into the program, Oren was able to speak for a total of 2 minutes and 21 seconds. "I submit to you that is substantial interference with a meeting. The show could not go on." The prosecution argued that, although the ambassador finished some version of his remarks, the substantial interruptions prevented him from completing a question and answer session. The defense argued that the students were not bound to act in a "courteous" and "polite" manner, despite repeated admonitions from the professor organizing the event and the university chancellor. The charges were based primarily on a series of emails, which showed that students weighed several protest options and decided on the incessant interruptions. According to emails, the students rejected a silent protest and a number of other less aggressive methods of protest in favor of shutting down the ambassador with interruptions. The emails also showed that the students took steps took cover up the MSU's involvement in the disruptions, although they did not hide their intention to deny the ambassador his right to speak. Salam al-Marayati, executive director of the Muslim Public Affairs Council (MPAC) called the verdict "a sad day for democracy" in an interview on KPCC radio in Los Angeles. He predicted it would have a chilling effect on campus protest. He also accused the District Attorney's office of selective prosecution, saying it only went to court because it was an Israeli official protested by Muslim students. But a caller identifying himself as Mustapha, an MSU member, said the verdict would not slow student protesting at all. 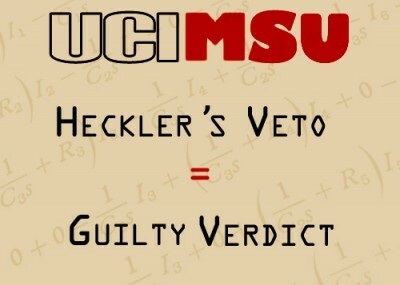 If Oren returned to UCI, Mustapha said, he would protest the speech in the exact same way as his convicted colleagues. The students' actions met three critical conditions for conviction, Wagner told jurors. They willfully violated explicit rules and customs of the speech; they knew, or should have known, that their actions were criminal; and that their protest was a substantial interruption. The defendants ignored seven specific warnings from administrators and spurned opportunities for dialogue in order to seize control of the event. Defense attorneys countered that neither the university administration nor the police had the authority to stifle the students' freedom to protest. They called two university professors who argued that political speeches have no norms or rules that can stop protest, even if those standards come from police officers or from high level campus officials. In response to the prosecution's claims of a conspiracy, several defense lawyers used closing arguments to argue that the police and university had a conspiracy of their own. The charges were a politically motivated attack on the students' pro-Palestinian message, argued attorney Lisa Holder. This included creating unique rules for a political speech which would silence the protesters, as well as an organized plan to arrest any opposition to the event. Defense Attorney Jacqueline Goodman compared the protest to birth, saying that although it was "messy" it created something beautiful. Calling the defendants heroes, she likened their exercise of free speech to Martin Luther King and other proponents of free speech. "Rude is not unlawful, peaceful protest is not unlawful," she claimed. Other defense arguments focused on the technical aspects of the case. Defense attorneys disputed the times of disruptions as presented by the prosecution, arguing that organized MSU noisemaking should not be included in the disruption count. They also disputed holding the students responsible for audience reactions to their actions and the ambassador's decision to temporarily leave the stage. Ultimately, the trial has the potential to set strong limits on anti-Israel activism on American university campuses. "The conviction means that anti-Israel activists will think twice before trying to take over and disrupt Jewish events," stated Rabbi David Eliezrie, President of the Rabbinic Council of Orange County, who attended the ambassador's speech. "Free speech means respecting all opinions. The recognition of the rights of the ambassador is a victory not just for pro-Israel voices on campus but also for all Americans. Rowdy hooligans can't push around people acting according to the law." On March 3,4 Harvard University held a conference on a one state solution to the Arab Israeli conflict. But what was presented was only a one [Arab Majority] state solution to the conflict. A proposed presentation on a one lawful Jewish state solution wasn't permitted to be presented. Nor was an opportunity to have an op ed stating the facts appear in the Harvard Crimson. A Two State [temporary] solution will likely be presented at Harvard too, by Professor Alan Dershowitz who described the March 3,4 conference as an anti-semitic and anti-Zionist Hate Fest in NewsMax. I had asked President Faust at Harvard to help me in getting a one Jewish state view heard, or to at least get it printed in the Harvard Crimson. Her aide responded with a copy of Harvard's press release, stating that Harvard did not endorse the conference and remained "a free and open marketplace for ideas". See: http://www.israelnationalnews.com/Articles/Article.aspx/11323 In order to get my ideas before the Harvard students I paid for a quarter page ad in the Harvard Crimson print edition and its on line edition. So I finally got to Harvard's marketplace of ideas, but it wasn't free and my one time insertion was in a dimly lit corner of the marketplace. A "son of Harvard conference" was held at UCLA on March 14 or 15. The same problem existed. Only two of the three solutions to the Arab-Israeli conflict were presented. These were the one [Arab Majority] state, and the two state temporary solution. In the one state solution, the US will lose a democracy in Israel with a western culture, the Jews in Israel will become unwelcome guests in their own National Home, and the Jews in the Diaspora, such as in Toulouse, will find there is no place left on earth where they can go and not be in the minority. In the interim, the Jews and Christians will lose quite a lot of their heritage, and in the long run the two state solution will become one Arab state. The third solution is based on the grant at San Remo in 1920 of exclusive political rights to World Jewry, in trust, to vest when the Jews had attained a population majority. If the Pres. of the US was giving a speech, could the Muslim students do the same to him? Finally someone has stood up to the belligerence of a muslim group intent on stopping the rights of others, in particular a Jewish organization. The judge has made a wise judgement and the defenders have done what they needed to try to do though they certainly were on the wrong side of the law. This is a retrograde action by a benighted administration. It has set back the cause of freedom to serve the interest of a repressive, racist regime.